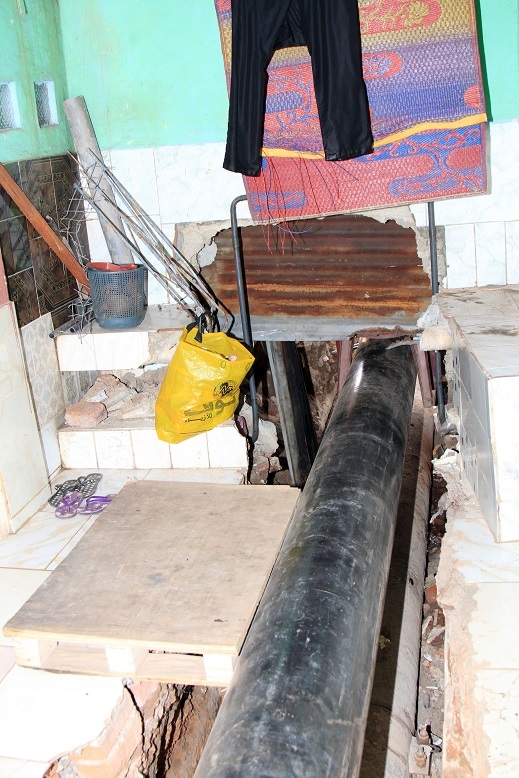 These photographs attached to the press report show that some of these pipe lines pass through the narrow front gardens and even through inhabitant’s living rooms. The minister Pa. Cha. Ranawake who is in charge of Ministry of Power and Energy is proclaimed to be an electrical engineer and one wonders whether his paper qualification even worth the paper it’s printed on, if he can blatantly and unashamedly ignore the risk associated with the highly inflammable and toxic petroleum product lines constructed through living rooms of inhabitants as shown in the ministry’s press release. According to the well-established international standards, the primary objectives of pipeline-related land use measures are to reduce the risk of damaging the pipelines by keeping human activity away from their immediate vicinity and to minimize the exposure of those living and working near a transmission pipeline in the event of an accident. Jurisdiction over land use matters traditionally rests with local governments, which results in wide variations in practices. However, most local governments do not address pipeline issues; when they do, they have few or no data on which to base land use regulations.However, It is up to the operator and the Ministry to provide necessary protection minimizing or mitigating hazards and risks to the public, pipeline workers, and the environment. 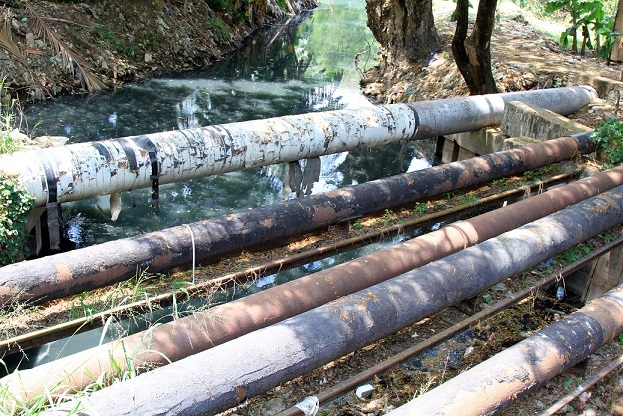 Pipeline failures can occur for a variety of reasons, including corrosion, environmentally-assisted cracking, equipment failure, material defects, environmental incidents (such as landslides and washouts) and human interference (such as being hit by heavy machinery). Feasibility of developing risk-informed guidance that could be used in making land use related decisions as one means of minimizing or mitigating hazards and risks to the public, pipeline workers, and the environment due to future hazardous liquids and petroleum product transmission pipelines. 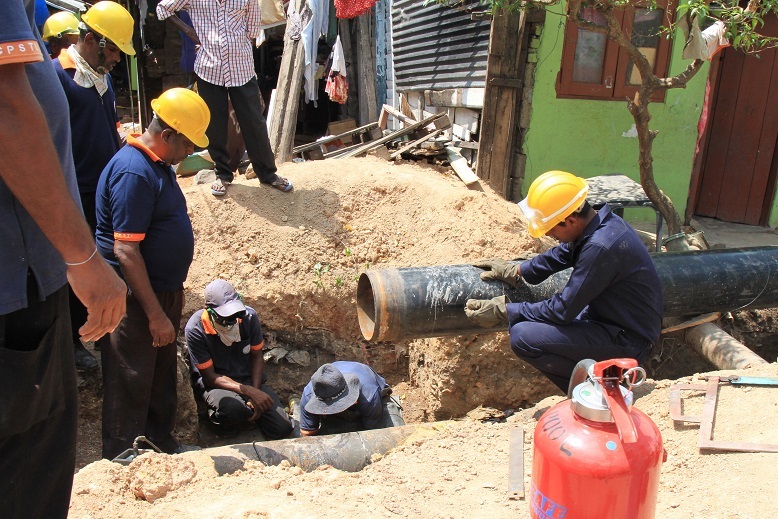 In assessing the feasibility of such an approach, the ministry should consider such factors as existing or proposed land use and zoning practices; competing needs of compatible uses, reallocation of land for effected dwellers including multiple uses of rights-of-way; pipeline design, age, diameter, pressurization, and burial depth; and the commodity transported. The Ministry should also consider the various hazards posed by transmission pipelines to life, property, and the environment in the vicinity of these pipelines, as well as the need to balance pipeline safety and environmental resource conservation issues (e.g., preservation of trees and habitat) in pipeline rights-of-way (recognizing operators’ regulatory obligations to patrol rights-of-way, including inspection by air and land). කොළඹ වරායේ සිට කොළොන්නාව දක්වා ඉන්ධන ප්‍රවාහනය කරනු ලබන භූගත නල පද්ධතියේ කඩිනම් අළුත්වැඩියා කටයුතු ඇරඹේ. කොළඹ වරායේ සිට කොලොන්නාව තෙල් ගබඩා සංකීර්ණය වෙත ඉන්ධන ප්‍රවාහනය කරනු ලබන, සී.පී.එස්.ටී.එල්. ආයතනය සතු, වසර 45 ක් පමණ පැරණි භූගත නල පද්ධතිය මේ වනවිට දැඩි ලෙස අබලන් වී ඇති අතර ඒ තුළින් තෙල් කාන්දුවීම හේතුවෙන් විවිධ අවස්ථා වලදී තෙල් සංස්ථාවට විවිධ ගැටළුවලට මුහුණ දීමට සිදුවී ඇත. මෙම භූගත නල පද්ධතිය තුළින් තෙල් කාන්දුවිමෙන් සිදුවන අපතේයාම සහ නල පද්ධතියේ අළුත්වැඩියා කටයුතු සිදුකිරීම සම්බන්ධයෙන් විදුලිබල හා බලශක්ති අමාත්‍ය පාඨලී චම්පික රණවක මැතිතුමාගේ විශේෂ අවධානය යොමුවූ අතර එතුමාගේ උපදෙස් පරිදි, සී.පී.එස්.ටී.එල්. ආයතනය ආයතනයේ සභාපති රොෂාන් ගුණවර්ධන මහතාගේ උපදේශකත්වය මත, එම ආයතනයේ සේවකයින්ගේ සෘජු දායකත්වයෙන් මෙම භූගත නල පද්ධතියේ අළුත්වැඩියා කටයුතු මෙසේ සිදුකිරීමට පියවර ගෙන තිබේ. ඒ අනුව එහි පළමු අදියර වශයෙන් මෙම නල මාර්ගයේ බ්ලූමැන්ඩල් ප්‍රදේශයේ ඇති මීටර් 100 ක පමණ දිගින් යුත් කොටසක් කපා ඉවනත්කර ඒ සඳහා අළුත් නල පද්ධතියක් එළිමේ කටයුතු සිදුකර, එම නලය පවතින නලයට සම්බන්ධ කිරීම, අද (04) පෙරවරුවේ මහවත්ත ප්‍රදේශයේදී සිදු කරන ලදී. arjun mahendranThe entire business community was shocked with the blatant abuse of power of the Central Bank Governor Arjuna Mahendren to help his infamous son in law Arjun Aloysius, known for his infamous EPF deals with the previous government, resulting in the fund losing over 2 billion Rupees. To date the government has not investigated a single transaction and it will never happen under the current regime. To add to all this the Central bank recently announced its 30 year bond and according to Central Bank expectations the rates were expected to be in the range of 9.5%. 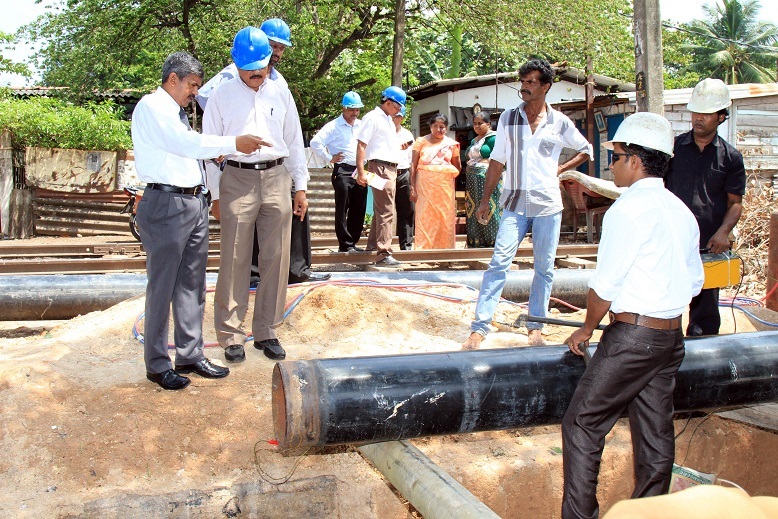 However, the rate went up to 12.5% on a directive of the new Governor Mahendran. His son in law however new about this well in advance and cashed in raking in a big profit. The main bidder his son in law who bid at 12.5% obviously had inside information and as a result gained high profits where as the banks and the other financial institutions who made their bids according to the public information given by Central Bank lost out to the company owned by Mr. Mahemdren’s son in law. Also, during the last week several 5-10 year bonds at low rates were sold by CB Governors’ Son in law Arjuna’s company and reinvested in the 30 year bond , because he had inside information from the Central Bank that the rates would go up to 12.5%. CB governor’s son in law were involved in the previous regime’s EPF dealings amounting to Billions as well, no action has been taken so far against his company Perpetual ltd. Now he has taken it to another level because he has the support of his Governor Father in law and the Prime Minister whom he refers to Uncle Ranil in conversations. God save mother Lanka , we have jumped from one frying pan to a bigger frying pan. THE HURRY IS NOT TO FINISH THE PIPELINE. THE HURRY IS TO COLLECT THE COMMISSIONS FROM THE CONTRACTORS. DAMNING DISGUSTING SCOUNDREL. Champaka nothing but a fraud,Liar and a twister. CID should investigate him first for corruption not others. Bad heart and a bad mouth typical JVPer. His time is numbered. There won’t be any Hela Urumaya but Urumaya in Hell for this double crosser. GOOD ONE RANJIT !!! I really like that. ****URUMAYA IN HELL**** Very appropriate title. He was a POOR office worker until he entered into shady deals with the MR govt. It was the MR govt. that made these 2 kallathoniyas from RAGS TO RICHES. This entry was posted on Wednesday, March 4th, 2015. You can follow any responses to this entry through the RSS 2.0 feed. You can skip to the end and leave a response.